Now is the time when companies are prepping their budgets, strategies, and staffing plans for 2013. If your plans involve hiring permanent, temporary, or even outsourced workers, selecting the right people for the right positions is paramount. That’s where employment screening comes in. 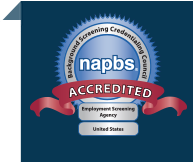 The National Association of Professional Background Screeners (NAPBS), of which we are a member, released its top 5 recommendations for screening workers in 2013. Accuracy is the prevailing theme and it’s one that we talk about a lot on this blog and promote in our day to day operations. Be Complete: Conduct a comprehensive background search to avoid negligent hiring. Relying on partial information or information that may be out of date can be as risky as not conducting a thorough background check at all. Be Efficient: Time is a precious commodity especially for recruiters. Look for ways to utilize technology to help create efficiencies. Talk with your background screening provider about ways to improve your process to save you time and ultimately reduce your cost. Be Thorough: As an employer, you have certain responsibilities under the law. Make sure that all background screening practices meet federal and state regulations as well as industry requirements. Be mindful of the new Equal Employment Opportunity Commission guidelines for the use of criminal records and the Fair Credit Reporting Act. Be Analytical: Consider job responsibilities when screening candidates. Go beyond basic background information and assess job relatedness and business necessity, drawing a corollary between these factors and the role for which you are screening. Be Consistent: Develop a method for a targeted level of screening for each open job position to align with business needs and job relatedness. In looking at the best practices above, it’s clear that the number one concern is accuracy. It’s what employers, candidates, and professional background screening companies care about most. Millions of employee background checks are performed each year to help employers make better hiring choices, create safer work environments, meet legal responsibilities, and provide safer environments for employees and customers. As a background screening provider, we believe that the more responsibly and accurately we perform these checks, the better we serve employers, applicants, employees, and the community at large. Read the full NAPBS press release here.